Regardless of where it flows, water brings life. At every depth, from oceans to puddles, it invites all kinds of organism to thrive. When humans started stacking up villages and cities, we did so on riverbanks, coasts and shorelines where food and water were abundant and the currents allowed for pre-industrial transit. But a few eons in, both shallow and deep bodies are choked with man-made waste, threatening the life it sustains. Brian Linton, 31, CEO of United By Blue, wants to do something about that. Through lots of experimentation and experience throughout his career, Linton found that there is no easy way to streamline the conservation process, and he has learned which steps (and in what direction) to take through his business to achieve his goals. 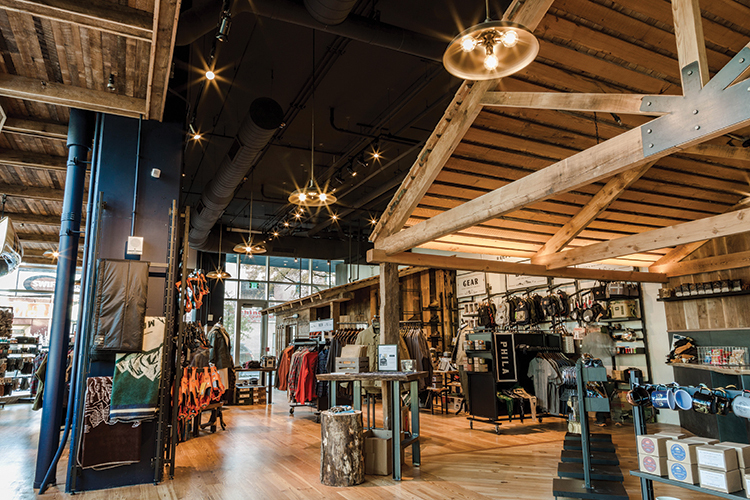 United By Blue, an environmentally conscious outdoor apparel brand and café, whose flagship store opened in Old City in November, is where he’s landed. For every purchase, the company facilitates the removal of 1 pound of trash from waterways. Funding environmental protection and providing durable, sustainably produced clothing costs money. So while it’s understandable for some customers to look at an $80 price tag on a flannel shirt in United By Blue, blink twice and leave the store, Linton has a reason for the costs of his products. When you’re making clothes from sustainable materials such as organic cotton, recycled polyester or bison fiber, it’s easy to burn through somebody’s shopping budget. But Linton wants consumers to feel secure knowing their purchases are coming from a company that shares their sustainable beliefs, right down to the paint on the walls: United By Blue’s newest location in Philadelphia is LEED Platinum certified, the highest rating devised by the U.S. Green Building Council. But Linton’s business isn’t outdoor apparel. It’s the outdoors. With four locations in New York and Pennsylvania, United By Blue stores don’t quite cover 71 percent of the planet: That figure belongs to our planet’s water sources, which is where the real work of United By Blue has begun. Linton was infatuated with water and the life it breeds as an adolescent, and that passion for water has saturated his entrepreneurial career. Every step he’s taken through his business endeavors has included a component to benefit the conservation of oceans and waterways. Linton went to sleep every night during his childhood in Singapore with the humming filters and electric blues of 30 fish tanks as his nightlight. After growing up in Southeast Asia, he made his way across the world, receiving educations formal and informal. He finished his BA in Asian studies at Temple University, where he won a business-plan competition in 2008, and spent the following summer driving from Maine to Florida selling stone necklaces to raise money for water conservation. Soon, the kid who had gone to sleep in a bedroom full of fish tanks figured out that his impact could be deeper if he narrowed the channel through which his entrepreneurial instincts rushed. Soon, Linton’s business attracted people who shared his enthusiasm for clean water. In January 2016, Kelly Offner, a fellow Temple graduate, took over running United By Blue’s cleanup programs, including one on Oct. 3, during which 123 volunteers cleaned 4,200 pounds of trash off of Pier 68 on the Delaware River Waterfront. Offner has spearheaded United By Blue’s efforts to join an expanding community of environmentally conscious businesses. United By Blue now focuses on rallying its 10,000 volunteers who have lifted 1 million pounds of garbage from our waterways. Linton has determined that the company’s best course of action has been to provide opportunities and direction for the masses of people willing to put their environmental values into action. That support continued with a second annual celebration of “Blue Friday” this year, an event Linton calls “the anti-Black Friday,” on which United By Blue encourages people to go out the day after Thanksgiving and pick up trash. Considering the severity of more and more instances of pollution, pushing back requires levels of stamina and tenacity that are more easily reached as a group. Linton, having grown the United By Blue brand to 80 employees in eight years, now sees opportunities for growth everywhere. “We do encourage the DIY movement as well as joining us to do cleanups,” he says. “Blue Friday is ‘do it yourself’; we sent out bags, we sent out bandanas and gloves and things like that, but on a regular basis, we’re organizing and hosting cleanups across the country. The only way that it’s possible is if you have the diligence and discipline to continue the course that you aspired to at the beginning, and make sure you’re doing everything consistently and authentically. The hope is that “successful business” can be redefined to mean more than just a line around the corner or a ledger full of black ink. It can mean local businesses using their platform to activate activists. For United By Blue, that means uniting around clean water, a universal need that the team believes is deserving of our collective effort to be sustained. It’s a lesson learned from Linton’s ankle-deep globetrotting and the rousing of thousands of volunteers to the cause of purer waterways: Grassroots grow where clean water flows.